The MAYA MOUNTAINS SECOND ANNUAL FOLK MUSIC FESTIVAL IN 2005 will offer a SPECIAL CONTEST FOR TEENAGE MARIMBA PLAYERS from the Cayo District with a Grand Prize of $1,400 Bz for the winner. The prize will continue to increase until contest time as we collect more donations. We will correct the total GRAND PRIZE as we progress through the year. If you want to win and you are between 13 and 19 years of age, living in the Cayo District, start practicing now! This Contest Grand Prize for teenagers could easily reach $5000 or $10,000 by competition time. current prize total has risen by $200 on May 20th, 2005: $1200 is now the GRAND PRIZE TO THE TEENAGE MARIMBA PLAYING WINNER! We are excited that you are visiting our web site. This year we are sponsoring through donations, from a ($1000) In March, to a $1,200 new total Prize in mid-May, and now another boost to $1,400 prize level as of May 28th; to any Cayo District Teenager, of either gender who wins the MARIMBA PLAYING CONTEST. There are no TEENAGE MARIMBA PLAYERS in the nation of Belize! This contest is meant to replace an older dying generation of adult Folk Music Marimba Players with new a new generation. The TEENAGE MARIMBA PLAYING CONTEST RULES ARE THAT THERE MUST BE A MINIMUM OF THREE TEENAGE CONTESTANTS WITH THE CAPABILITY OF PLAYING MELODIES OF FIFTEEN DANCE TUNES IN VARIATIONS, AND HOPEFULLY EXTRA MARKS WILL BE GIVEN FOR COSTUME, STYLE, TRILLS, ROLLS AND VERSATILITY. The intent of the contest PRIZE MONEY is to encourage teenagers in the Cayo District of mountainous Belize to learn the 150 year old Folk Music instrument played out in Western Belize. The oldest professional currently playing the Marimba instrument is 91 years old, he has been playing 77 years, since he was 13 years old. There is a good side line income available to Marimba players in the Tourism Industry, Hotels, Village Festivals, Weddings and birthday parties. A good set of twenty year old Marimba players with an orchestral size instrument could easily go on a tour of Europe, or North America, where the instrument and music is unique. If you donate to the Teenage Grand Prize, e-mail us if you are in Belize and we will give you an Atlantic Bank account number to deposit at. If you are in a foreign land and have a credit card, contact us by email and we will tell you how to donate via Pay Pal. Thankyou for your support, now and in the future. This is a NON-PROFIT FESTIVAL and TEENAGE CONTEST. One hundred percent of any donations go to the Festival success. There are no management, or administrative fees. This is a labor of love, patriotism done by volunteers of like mind. Donors so far are: Mrs. Sharon Auxillou Urscheler of Tradewind Beach Suites on Caye Caulker, Ms Wendy Auxillou of Auxillou Beach Suites on Caye Caulker, KC of Fort Meyers Florida, Al Ayers a Belizean living in the USA, Brooks and Irene Mason living in Northern California, Kevin Chisolm from Cape Breton, Canada. 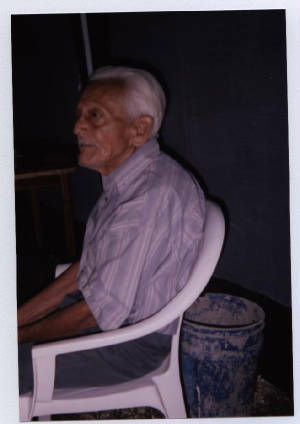 Felipe Moralez was the STAR of the 2004 ANNUAL MAYA MOUNTAINS FOLK MUSIC FESTIVAL at 91 years old. He lives in San Jose Succotz across from the ancient Xununtanich Maya Temple on the bank of the Mopan River. 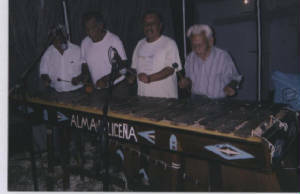 Felipe has been playing since he was 13 years old, for over 77 years of Marimba playing in Belize. To be held in December 2005 at Falconview Hacienda in Hillview, Cayo District, Western Belize, Central America. It is possible that we may include during the day, a Folk Art Festival along with the evening entertainment of Folk Music. We have a lot of slate and wood carvers, potters, painters and different artists in the Cayo District. Since I myself the organizer, will not arrive until early December on site, we shall see if we can get artists to come and lay out their art work for a day festival as well. We will have to leave that though for the last couple of weeks arrangement, prior to the Folk Music Festival arrangements. e-mail: Ray Auxillou, c/o Teenage Marimba Contest entries! CD Folk Music Marimba memories! $25 for one, $20 each on a dozen, $15 each for two dozen or more. The Marimba is a unique instrument made with antique hand tools and out of jungle hardwood trees. The instrument is dying out, but we hope to change that. 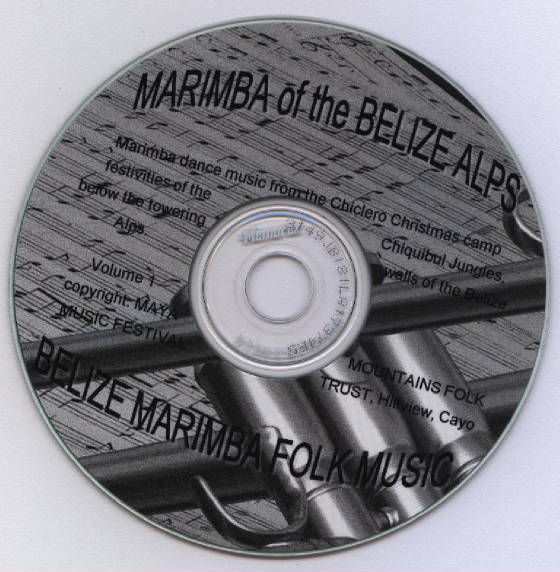 This CD Volume 1, is a historical folkmusic record, in case all the old timers who play this instrument die out in Belize. The music is unique and beautiful. Bands would go out to the logwood and chicle camps at Christmas Festival times, to play for a holiday jamboree in the jungles. Nowadays there are still about three Marimba orchestras in Belize, playing for weddings and village festivals. Occasionally for the tourist trade. It takes a lot of practice to get a 3 to 12 man Marimba orchestra playing on one instrument. All CD purchase money goes to support the Annual MAYA MOUNTAINS FOLK MUSIC FESTIVAL and are charitable donations. $1,400 IS THE NEW TEENAGE GRAND PRIZE TOTAL effective May 28th, 2005. From the starting $1,000 of March beginnings.